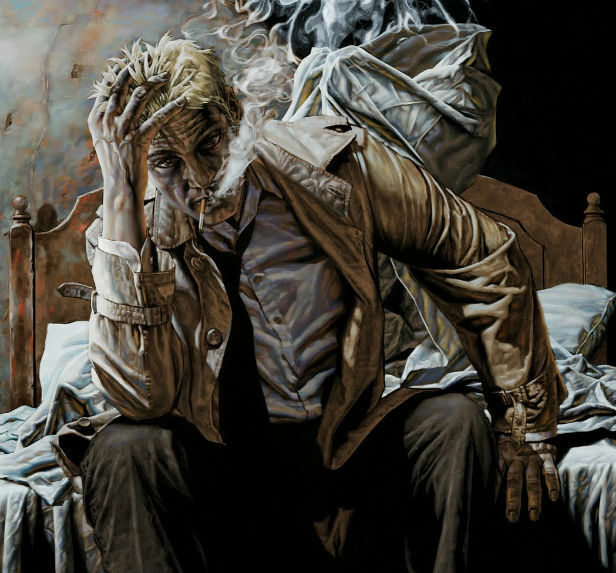 It was always a long shot, but NBC has snuffed any hope by comics fans that supernatural investigator and all-around bad example to kids John Constantine would be allowed to smoke in CONSTANTINE, this fall’s adaptation of the comic book Hellblazer. Producer David Goyer (Man of Steel) earlier had been hopeful that the network would let TV Constantine indulge in the comic book character’s trademark deadly addiction, but pilot director Neil Marshall (GAME OF THRONES) has confirmed that there will be No Smoking onscreen. I guess the Peacock network doesn’t want kids to think it’s cool to have a two-pack-a-day habit while drinking and battling demons. But at least teaser images and the first trailer suggest the pilot gets a lot right about the character. Maybe we’ll see everything except Constantine actually smoking – for instance, seeing ash trays, cigarette packs, or maybe talk of smoking without actually lighting up. This entry was posted in Behind the Scenes, Broadcast TV, Comic Book Adaptations, Prime-time TV, Supernatural and tagged Constantine, David Goyer, DC Comics TV Shows, John Constantine, NBC, Neil Marshall, smoking. Bookmark the permalink. I’m sorry to say this, but I don’t think Constantine will do very well on lamestream TV. Too bad they couldn’t have made a deal with cable such as Starz or Showtime. I agree that basic cable would probably be more open to the John Constantine we know from the comics, a show on NBC will probably be seen by more viewers. And (so far) Fox has done well leaving SLEEPY HOLLOW alone, and SUPERNATURAL prospers on The CW. Can NBC resist the urge to tamper?